“Having been unemployed and fairly insulated for some time, I was referred to TACT’s Positive Steps course by CEIS in Irvine. This was just what I needed, friendly and welcoming staff running an interesting and engaging course in an informal setting. Not only was Positive Steps helpful, but it also opened up to me the other great opportunities and options TACT can supply. I went on to take the Mindfulness classes, which I found very helpful and still use to this day. After time spent with TACT and the beneficial courses that it offered, I felt more able to engage in one of the other things they can help with – namely, volunteering. I was offered the opportunity to volunteer with TCTV at the Trinity Church in Irvine and help with the heritage project on the history of the church. This was a very rewarding project that produced a half hour video on the church from its inception to the present day (it can be found on YouTube here if you are interested 🙂 and it was a privilege to be involved with it. TCTV also have a digital suite available which also includes Virtual Reality equipment. This leads me on to another area of help and development TACT was involved with. 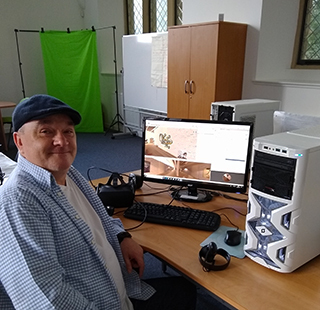 I also became interested in the other digital work that was going on at TCTV and took up a funded online course in VR at the University of London (something I would not have considered prior to being referred to TACT). I would not have been able to complete this without the access to this expensive equipment. 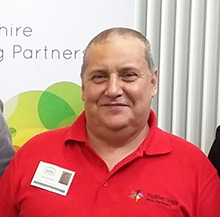 “Before I started the Positive Steps with Partners project I had lost all confidence in myself. I was stuck in the house and not having any luck with job applications and not getting any job interviews either. My mum had met with Cheryl from the Positive Steps with Partners project and arranged for me to meet Cheryl. The project sounded interesting and I thought it would be worth giving it a go. The staff who delivered the training – Peter and Susan – are really good and they helped me feel at ease and relaxed so I really was able to enjoy the training. 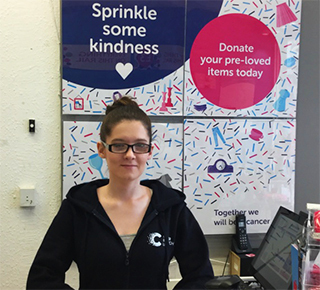 After the training, I really started to feel better about myself and then I was set up with a volunteer work placement with the Cancer Research Superstore in Irvine. This placement really boosted my confidence – especially when talking to people. I’m feeling more confident in working with others and have more faith in myself, the staff and volunteers are all very supportive and have really helped me along the way. After a few months in my placement, a job opportunity came up in the smaller shop for an Assistant Manager. I applied for the position and was successful. I am over the moon, my first ever job as an Assistant Manager is mind-blowing I’m loving every moment. I enjoy supporting volunteers and working in such a busy environment. “Hi my name is Jim and I’m 55 years old. The Positive Steps with Partners project has made me more self confident and helped me develop new skills and qualities for work. Before I started the course I was starting to feel a bit low and demotivated in the search for employment due to the lack of feedback from job applications. The project helped me to set goals along with a life coach who helped me to really focus on my goals and get me on the right path in achieving them. The mindfulness course helped me to stay more positive and cope with stress better. 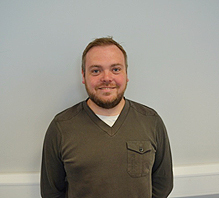 “Hi I’m John, I’m 26 and until now have never been in paid employment. The Positive Steps with Partners project has been a great help in building my confidence and helping me feel more confident in my own abilities. I started the project in July and by September I was in work! The project gave me a focus helping to bring a routine and structure back into my life, part of the project is to set personal goals and my main goal was to find full time employment so it feels great knowing I have already achieved my main goal. The project helped me get this job and I am glad I decided to get involved as my life has totally been turned around for the better. The staff at The Ayrshire Community Trust are very supportive and good at helping you look at different options that are available to you. 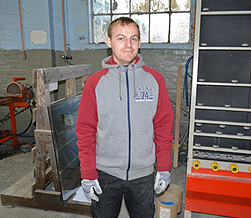 All the guys here at Andrew Wright Glass have been great in helping me settle in and training me on the job. I love being employed and being part of such a great team”. “Hi, I’m Del, I’m 34 years old. I was 5 months unemployed when the Positive Steps program was recommended to me. I thought it was something that would really help build my confidence and help me get back in to work. I was initially very nervous about it but the staff at The Ayrshire Community Trust and the other participants made me feel much more comfortable. Cheryl, Peter and all the other staff have been a fantastic help. Since starting the program I have also completed the Mindfulness course – which has helped a lot with anxiety issues, gained an SQA qualification and I now volunteer with the Scottish Fire and Rescue Service which I find very fulfilling. It’s a small team but they are really supportive and enthusiastic. I have now – through the help of TACT and Positive Steps – found full time employment with Renfrewshire Council and I am excited about my new role. I also hope to continue to volunteer with Scottish Fire and Rescue if I can. I definitely recommend the Positive Steps program as it has made a real difference to my life”.